Talcum Powder Poisoning is the accidental or intentional intake (consumption or inhalation) of talcum powder. Small babies are especially vulnerable to talc dust inhalation resulting in associated symptoms that can be severe. What is Talcum Powder Poisoning? What are the Causes of Talcum Powder Poisoning? What are the Signs and Symptoms of Talcum Powder Poisoning? How is First Aid administered for Talcum Powder Poisoning? Who should administer First Aid for Talcum Powder Poisoning? 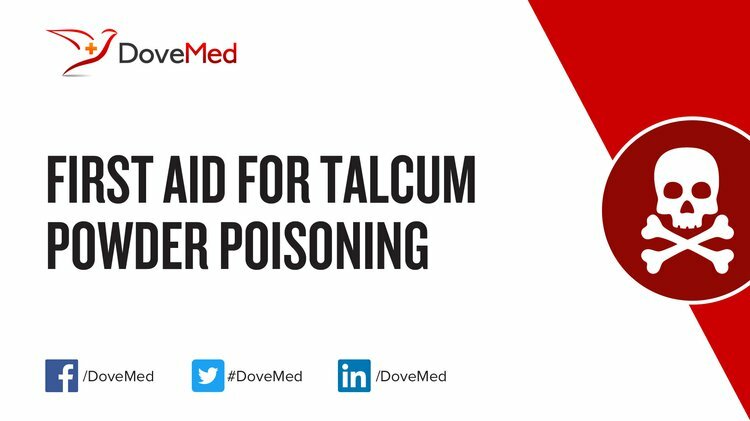 First aid for Talcum Powder Poisoning is administered by healthcare professionals. What is the Prognosis of Talcum Powder Poisoning? Note: Long-standing lung exposure to talc, such as occupation-related, can present pulmonary damage including risk for cancer. How can Talcum Powder Poisoning be Prevented? Gondal, M. A., Dastageer, M. A., Naqvi, A. A., Isab, A. A., & Maganda, Y. W. (2012). Detection of toxic metals (lead and chromium) in talcum powder using laser induced breakdown spectroscopy. Applied optics, 51(30), 7395-7401. Karageorgi, S., Gates, M. A., Hankinson, S. E., & De Vivo, I. (2010). Perineal use of talcum powder and endometrial cancer risk. Cancer Epidemiology and Prevention Biomarkers, 19(5), 1269-1275. Gordon, R. E., Fitzgerald, S., & Millette, J. (2014). Asbestos in commercial cosmetic talcum powder as a cause of mesothelioma in women. International journal of occupational and environmental health, 20(4), 318-332. Yan, C. H., Xu, J., & Shen, X. M. (2013). Childhood lead poisoning in China: challenges and opportunities. Environmental health perspectives, 121(10), A294. Neill, A. S., Nagle, C. M., Spurdle, A. B., & Webb, P. M. (2012). Use of talcum powder and endometrial cancer risk. Cancer Causes and Control, 23(3), 513-519. Rosenblatt, K. A., Weiss, N. S., Cushing-Haugen, K. L., Wicklund, K. G., & Rossing, M. A. (2011). Genital powder exposure and the risk of epithelial ovarian cancer. Cancer Causes and Control, 22(5), 737-742. Marchiori, E., Lourenço, S., Gasparetto, T. D., Zanetti, G., Mano, C. M., & Nobre, L. F. (2010). Pulmonary talcosis: imaging findings. Lung, 188(2), 165-171. Ullah, H., Noreen, S., Rehman, A., Waseem, A., Zubair, S., Adnan, M., & Ahmad, I. (2017). Comparative study of heavy metals content in cosmetic products of different countries marketed in Khyber Pakhtunkhwa, Pakistan. Arabian Journal of Chemistry, 10(1), 10-18.